In 2002, Georgia declared grits as its official prepared food. So, being a transplanted but almost native Georgian, I thought it only fair that I revisit grits on a semi-regular basis on Southern Boy Dishes. If you grow up in the South, grits practically become part of your DNA. In my childhood, this ubiquitous staple was found on breakfast tables across the deep South. As time has passed though, the days of families sitting down for breakfast have long gone. The rise of fast food breakfast and busy schedules have people grabbing their morning meal on the run. Over the past several years, grits have had a renaissance as more of a dinner food. I’ve eaten a lot of grits in my day, but I have to say that I find the nouveau version of grits much more appetizing. As a southerner, I’m happy to see this otherwise bland food come back to life in a variety of delicious ways. 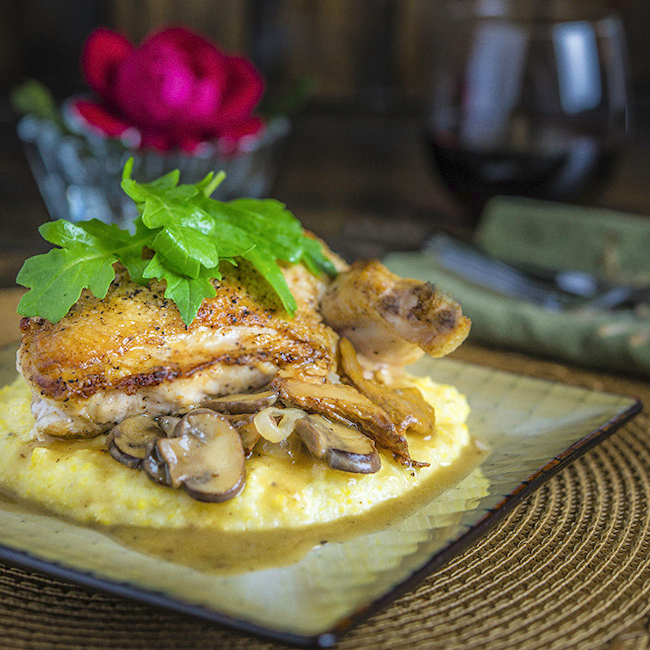 For today’s post, I’ve created a pan-seared chicken breast with parmesan grits and mushroom gravy. For this recipe, I wanted boneless chicken breasts with the skin intact. Unfortunately, boneless breasts with skin are hard to find, so I started with a whole chicken. I cut the chicken into pieces and deboned the breasts. This video demonstrates how to debone a chicken breast. For some reason, I associate mushrooms with fall, so a wild mushroom and shallot gravy seemed to be the perfect complement to pan-seared chicken and Parmesan grits. Although there are a few steps to this recipe, it is well worth the effort. I think you’ll really enjoy this hearty chicken dinner. 1. Preheat oven to 425 degrees. Season chicken breasts with salt and pepper. 2. Heat olive oil and butter in a large skillet over medium high heat. When oil and butter are very hot, place breasts skin side down in oil. Cook for 3 to 4 minutes until skin is golden brown. Turn chicken and brown other side for 3 to 4 minutes. 3. Remove from skillet and place breasts on a baking sheet. Place in oven and cook for 10 to 15 minutes or until internal temperature reaches 165 degrees. Cooking time will depend on size and thickness of the breasts. 1. Heat olive oil and 1 tablespoon butter in the same skillet. Add shallots and saute for 1 minute. Add mushrooms and saute for 4 to 5 minutes until browning and all liquid is evaporated. 2. Add additional 3 tablespoons of butter and allow to melt. Add flour and whisk until incorporated. Continue cooking for 1 minute. Add chicken stock, thyme, salt, and pepper and whisk until well combined. Bring to a boil and reduce heat to simmer. Continue simmering for 6 to 8 minutes until gravy is thickened. Remove from heat. Bring milk and chicken stock to a boil in a medium pot. Add corn meal and whisk until grits are incorporated into liquid. Reduce heat and simmer for 8 to 10 minutes or until starting to thicken. Whisk regularly while cooking. Add cheese and salt and whisk to combine. Remove from heat. Ladle grits on plates. Spoon mushroom gravy over grits and top with chicken breast. Top with a few arugula leaves and serve immediately. This looks so good. And to tell you the truth, it is a lot like one of our family favorites, dishes, polenta with cheese. I often finish polenta with a big handful of parmigiano and some butter, especially when i am going to top it with a nice ragu or grilled meat. So I say “Complimenti” to you on this very tempting dish. If we’re talking about corn on the cob, I always prefer the taste of white corn over yellow corn. However, for grits I’m not sure I can make a big distinction in taste between the two. I probably prefer yellow grits just for aesthetic reasons. Me to, I prefer yellow over white grits. I live in south Ga. So grits is something I enjoy. Lots of ways to enjoy them. CHEESE GRITS!!! These are one of the best things about moving back to the South and I love this whole recipe you’ve done. Looks like Sunday dinner to me! Nicely done, Bill. This looks amazing! I’m going to try it this weekend. Thanks so much, Irma. I hope you enjoy the recipe! Parmesan grits? I’m sold! This is fabulous — thanks. Oh gosh that looks so yummy! Great food for Fall. Thanks, Karen. So nice to see your comment! Your presentation is gorgeous and your dish is comfort food reinvented! Tomorrow night we going to have the second half of a roast chicken and I was sitting here this what to serve with it. Now I know. I have everything for your mushroom gravy and grits! Can’t wait to sink my teeth into this combination of goodness. Thanks Bill! Thank you, MJ. I hope you enjoy it! When I saw this photo, I gasped. Wow, this is spectacular to behold. The first time I tried Southern grits, for breakfast, I was a little underwhelmed (this was in Louisiana). Fast forward to today, and I’m with you on savory grits. Polenta? Grits? Are they the same or different? I really don’t know. Anytime Parm is added I’m so there. This looks fabulous, Bill. Thank you so much, Debby! I’ve always said Polenta is a fancy Italian name from grits. It’s all the same thing in my book. Thanks for dropping by! Looks so delicious! Had to pin to my dinner recipes to try!